Backed by Venezuela’s military, President Nicolas Maduro went on the offensive against an opposition leader who declared himself interim president and his U.S. supporters, setting up a potentially explosive struggle for power in the crisis-plagued South American nation. A defiant Maduro called home all Venezuelan diplomats from the United States and closed its embassy on Thursday, a day after ordering all U.S. diplomats out of Venezuela by the weekend because President Donald Trump had supported the presidential claim of Juan Guaido. Washington has refused to comply, but ordered its non-essential staff to leave the tumultuous country, citing security concerns. The Trump administration says Maduro’s order isn’t legal because the U.S. no longer recognizes him as Venezuela’s legitimate leader. Meanwhile, all eyes were on Guaido whose whereabouts have been a mystery since the 35-year-old was symbolically sworn in Wednesday before tens of thousands of cheering supporters, promising to uphold the constitution and rid Venezuela of Maduro’s dictatorship. Speaking from an undisclosed location, Guaido told Univision he would consider granting amnesty to Maduro and his allies if they helped return Venezuela to democracy. Besides the United States, much of the international community rallied behind Guaido, with Canada and numerous Latin American and European countries announcing that they recognized his claim to the presidency. Trump promised to use the “full weight” of U.S. economic and diplomatic power to push for the restoration of Venezuela’s democracy. Maduro has been increasingly accused of undemocratic behavior by his opponents, and has presided over skyrocketing inflation, a collapsing economy and widespread shortages of basic goods. Meanwhile, Russia, China, Iran, Syria, Cuba and Turkey have voiced their backing for Maduro’s government. China’s Foreign Ministry called on the United States to stay out of the crisis, while Russia’s deputy foreign minister warned the U.S. against any military intervention in Venezuela. Alexei Pushkov, chairman of the information committee at the Russian Federation Council, called Guaido’s declaration “an attempted coup” backed by the U.S.
Russia has been propping up Maduro with arms deliveries and loans. Maduro visited Moscow in December, seeking Russia’s political and financial support. Over the last decade, China has given Venezuela $65 billion in loans, cash and investment. Venezuela owes more than $20 billion. Diplomats at the Organization of American States held an emergency meeting Thursday on the Venezuelan crisis, during which 16 nations recognized Guaido as interim president. Domestically, attention has been on Venezuela’s military, a traditional arbiter of political disputes in the country, as a critical indicator of whether the opposition will succeed in establishing a new government. 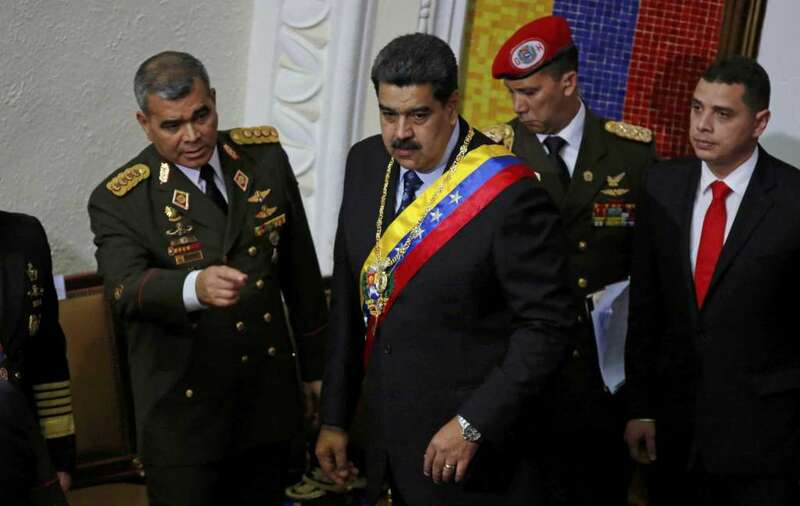 Venezuela’s top military brass pledged their unwavering support to Maduro, delivering vows of loyalty Thursday before rows of green-uniformed officers on state television. A half-dozen generals belonging largely to district commands and with direct control over thousands of troops joined Maduro in accusing Washington of meddling in Venezuela’s affairs and said they would uphold the socialist leader’s rule. Defense Minister Vladimir Padrino Lopez, a key Maduro ally, dismissed efforts to install a “de-facto parallel government” as tantamount to a coup. Guaido’s father, who has lived in Spain for the past 16 years, has called on the military to drop its allegiance to Maduro. Wilmer Guaido, a taxi driver on the island of Tenerife, told private Antena 3 television on Friday, that Venezuela’s armed forces should be loyal to the country, but not to a specific leader. Juan Guaido has said he needs the backing of three critical groups: The people, the international community and the military. While yesterday’s protest drew tens of thousands to the streets and over a dozen nations in the region are pledging support, the military’s backing is key. Though many rank-and-file troops suffer the same hardships as countless other Venezuelans when it comes to meeting basic needs like feeding their families, Maduro has worked to cement their support with bonuses and other special benefits. In a video addressing the military earlier this week, Guaido said the constitution requires them to disavow Maduro after his May 2018 re-election, which was widely condemned by the international community because his main opponents were banned from running. But there were no signs that security forces were widely heeding Guaido’s call to go easy on demonstrators. Gunfire during the protests and looting left 21 dead between Wednesday and early Thursday in the capital of Caracas and throughout the country, reported Marco Ponce, coordinator of the non-profit Venezuelan Observatory of Social Conflict. The U.N. human rights chief is calling for independent investigations into the violence linked to protests. Many Venezuelans were looking for Guaido to re-emerge and provide guidance on the opposition’s next steps. Guaido, a virtually unknown lawmaker at the start of the year, has reignited the hopes of Venezuela’s often beleaguered opposition by taking a rebellious tack amid Venezuela’s crushing economic crisis. He escalated his campaign Wednesday by declaring that the constitution gives him, as president of the congress, the authority to take over as interim president and form a transitional government until he calls new elections. Christine Armario reported from Bogota, Colombia. Associated Press writers Josh Goodman and Fabiola Sanchez in Caracas contributed to this report. Sign up today for monthly newsletters from us. We will be serving you with new monthly content. CLICK HERE to go to the page to sign in and register your information you need to receive the Ubaldi Reports.